People who are found of pickle will surely like this. Even I was reluctant first to make a pickle with bitter gourd but found this very interesting and tasty once I had it from a friends place. 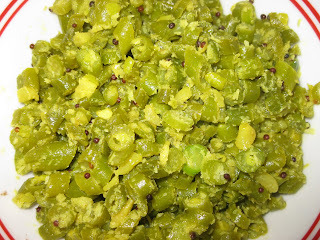 =►I have already published how to make fried bitter gourd (pavakka kondattam). =►Take 1cup of fried bitter gourd and mash it into pieces. =►When it cracks well add dry red chilies, fenugreek seeds, sliced shallots, ginger, garlic, curry leaves into it. 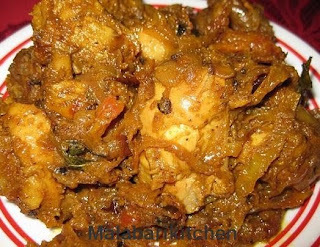 =►Then put turmeric, chilly powder and mix it well. =►Add ¼ cup of vinegar and when it boils well add mashed bitter gourd pieces. =►Saute it well and cook it for 1-3min and switch off the flame. =►Add ½ tsp of hing on over this pickle and mix well. 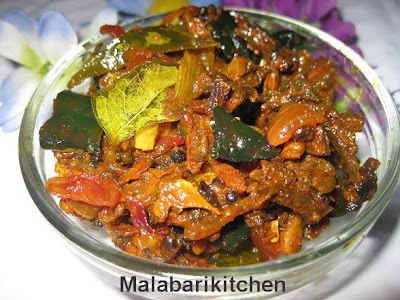 =►Serve it hot as a side with plain rice, chapatti etc. woowww.. bitter gourd pickle.. haven't tasted it.. yours looks colorful and with so much flavor.. looks delicious.. Bitter gourd pickle looks delicious Lisha. Awesome pickle, never tried pickle with bittergourd..superb! I always make with raw bittergourd. this version is new to me. Thanks for stopping by my space, Lisha. Am adding your blog to my list.